Happy Holidays! Today I have the first of three holiday giveaways and this one, courtesy of Broadway Nails, is spectacular. TWO lucky Babbling Brooke readers will each get a huge $100 Broadway Nails Gift Set filled with Broadway Nails and Broadway Nail products! To enter to win, just leave comments below. This giveaway will be open until January 1, 2011. Good luck, and Happy Holidays! Giveaway will close 1159 EST January 1, 2011. Two winners will be selected. Prize fulfillment will be handled by Broadway Nails. 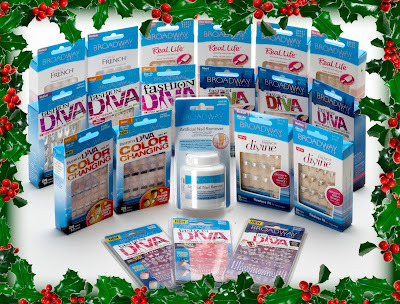 Thank you to Broadway Nails and their fabulous PR team for this great giveaway! Thank you for this great GA!! What a fantastic giveaway! I am a follower as Starlight thru GFC. Heres ur giveaway in my blog. I follow you on GFC as Lena Tallina! Thanks for such a fun giveaway! My email is soccersmiles240@aim.com. I'm a follower! http://twitter.com/soccerlove580/status/14790012197404672 I tweeted about the giveaway here! I've never tried Broadway's nails--awesome giveaway. kathyteo @ yahoo . com - I follow with GFC! Hi, great giveaway! I follow via GFC, email: walkerjs7920(at)gmail[dot]com. Happy Holidays! I'm a GFC follower as Chantal and my email is glitterkitten at hellokitty dot com. Thanks a lot for the chance. And I'm a follower. Hi, I'm a follower! Thanks so much for the giveaway! Hullo :) Please enter me. I am a follower via GFC under the name Kimber Y. My email is kirby.monk (at) gmail (dot) com. Thank you! Wow, please enter me:) I follow you via GFC and my email is fleurs dot nails at gmail dot com. I follow through GFC as Tameriska. Hi there! I'd love to enter on this giveaway. I blogged this give away!